When you’re a dreamy super-duper smartphone, it’s essential to flaunt a near-perfect performance to show off your muscle power – and that’s the case with the almighty Verizon Galaxy Nexus. We’ve had it for a short time, but we’re obviously going gaga about the whole Android 4.0 Ice Cream Sandwich experience, but more importantly, its speed needs to be top-notch in order for it to complement the entire package. Much like its contemporaries, the Verizon Galaxy Nexus is packing a dual-core processor with 1GB of RAM – in fact, it’s a 1.2GHz TI OMAP 4460 CPU. Needless to say, that’s probably more than equipped to handle most operations. With a static wallpaper, the handset exhibits very slick and fluid movements while navigating across the homescreen. Moreover, it’s very tight in tracking the placement of our finger. As for other basic tasks, like opening apps, it’s fairly instantaneous with its operation – so it’s easily admirable in our books. However, switching over to a graphically intensive live wallpaper, we do notice some noticeable bouts of choppiness, which does soften its aura. Nonetheless, it doesn’t appear to be terrible at all, but it does make you question the handset. Right away after completing the first pass with the Quadrant benchmark, it’s apparent that the app isn’t entirely fine-tuned to work with Ice Cream Sandwich – and of course, the scores we obtain aren’t indicative to its true potential. Specifically, it crawls in completing most of the graphical components of the test, but even worse, there’s a substantial drop in overall frames per second with most of them. All in all, it’s able to obtain scores ranging from 1,368 and 1,714. Hardly applaud worthy in this day and age, we have to reiterate that Quadrant doesn’t seem to be specifically aimed to work with ICS, yet. 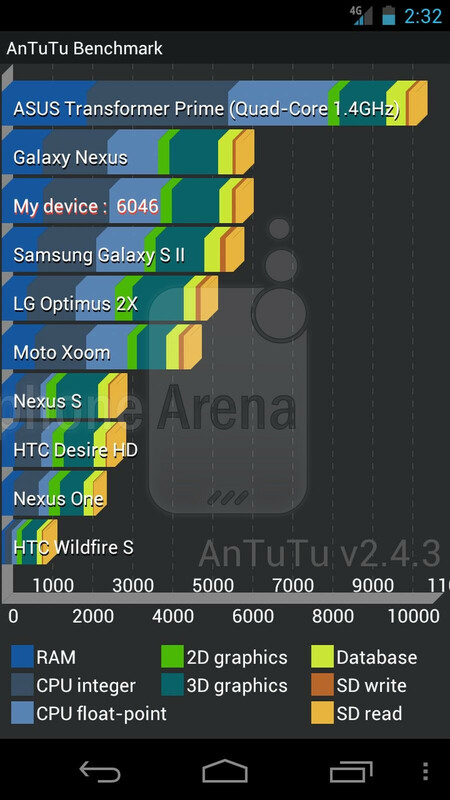 Meanwhile, the AnTutu benchmark test is a bit more telling, as we’re given a total score of 6,046, which meets the mark of the GSM version of the handset. As usual, you can take all the worth that benchmark tests offer, but above all, it’s ultimately the real-world performance that’s going to matter. Out of the box, it’s undeniably swift, well, with static wallpapers anyways. Of course, we’ll be putting it through further testing to see how it all shapes up in the end. Well all know the LTE model has the same horsepower, im just want to see what the LTE does to the battery life. Yeah Quadrant doesn't seem to like ICS.... there's no way in hell this device would score less than a 3000. Motorola Razr with the same Hardware Scored less than 3000. So what are u gonna Say? CNet and Techradar Reviewers said "Galaxy Nexus is only smoother in homescreen transitions than Galaxy SII and Galaxy Note mainly because of ICS. They both concluded that Galaxy Nexus is much slower than the two Exynos' phones in completing tasks"
Well Motorola RAZR has a smaller screen with lower resolution, a ti omap 4430, while the nexus has a ti omap 4460, and lastly omap processor were optimized for ICS, which is what the nexus is running and the razr is not, they are 2 different devices. ...the Razr has an OMAP4. xD the only difference between the two performance wise is the Galaxy Nexus has a slightly higher clocked GPU and the Galaxy Nexus has hardware acceleration support due to Android 4. Well, it looks like the processor in the Galaxy Nexus isn't inferior to the one in the GS2 like so many people were saying. Im very happy about that. Cant wait to get mine for T-Mobile in a couple months. According to what? Not based on these benchmarks because the GSII got double what this phone got. Many possibilities but still weird. if we're talking about the chips and only the chips, the exynos has no clearcut advantage at all, least none that I can find. Exynos has a VERY clear advantage: anandtech.com/show/5133/galaxy-nexus-ice-cream-sandwich-initial-performance As others have pointed out here, several of the Galaxy S II's in the US don't have their original Samsung hardware- the Exynos chipset with Mali 400 GPU was swapped for a Qualcomm chipset for 4G bandwidth compatibility. The Galaxy S II's with original Exynos chipsets beat the pants off the Galaxy Nexus. When said Galaxy S II's get the ICS update, the difference will only be more apparent. The Nexus devices are NOT meant to be hardware powerhouses, they are designed to be stable pure Android platforms- proof of concepts if you will. The Galaxy S line on the other hand is designed to be Samsung's flagship devices. If you really need proof of this, just look at the Galaxy Nexus' specs. It hardly has all of Samsung's bells and whistles: Only a 5MP camera, no expandable memory and a weaker chipset than a phone they released 3 months prior (the SGSII). The only two bullet points in favor of the Nexus is ICS and an HD screen (which is compelling of course). For the international market though, ICS is on its way to the Galaxy S lineup (SGSII and Note are confirmed) and the Note already has an HD screen. The Galaxy S II HD is also coming out which will negate this point. Moral of the Story: Import a Galaxy Note. Bigger HD screen, better chipset (1.4GHz Exynos), better camera, more storage capacity,and ICS is on its way (if you don't simply root it and load ICS yourself). the OMAP4460 is still slightly inferior to Exynos. Quadrant Standard has been very suckish lately. Extremely inaccurate. My Atrix scores between 2500-2800. The razr and Bionic gets scores in the low 2000's. But for some reason you seesamaing devices get 3000+. that's not true. the Razr can get as high as 2900-3000 and the Bionic can get as high as 2800. No its just im pointing out how outdated quadrant standard is. I've seen razr get scores thay low, but are surprisingly fast. Of course it's outdated. It uses the nexus one and evo to compare with. They should change the "comments" to "excuses from fandroids, lol. I can imagine what the comments section would look like if this turned out to be the ip4s' performance, lol. The iphone would be attacked unforgivingly for the slightest choppiness and lag, lol. But this is an android device, so of course there's a good reason why it's choppy, hahahahahaha. Man.. you are on a serious roll today. Does ip4s support live wallpaper? how would you know iOS is such a boring thing. Author has clearly mentioned... 1. "With a static wallpaper, the handset exhibits very slick and fluid movements". 2. "switching over to a graphically intensive live wallpaper, we do notice some noticeable bouts of choppiness"
The last time Quadrant Standard was updated was in Feb 2011. I think it is time for an update. I agree that you cannot go entirely based on these tests and their scores. My Xoom gets 1550-1700 on Quadrant and I've seen people get 2000's with the same non rooted unit that I have. But these test's do give us an idea on the phone's performance. If these are true for the Galaxy Nexus, then that is a shame. What a choppy laggy POS. I'll stick with my iPhone 4 S,and my galaxy s 2. I pull 5700s with my Rezound. Seems the S3 1.5 ghz isn't as far off from the performance of the Nexus or SGS2 as everyone thought, at least on AnTuTu. 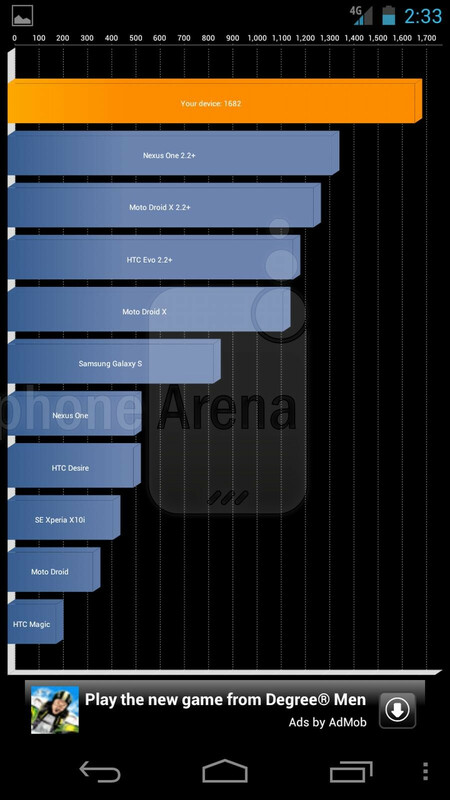 I wonder how it will perform with the improved hardware acceleration of ICS. remember too that it's higher clocked at 1.5GHz. the S3 is still trash compared to the OMAP4 and Exynos. 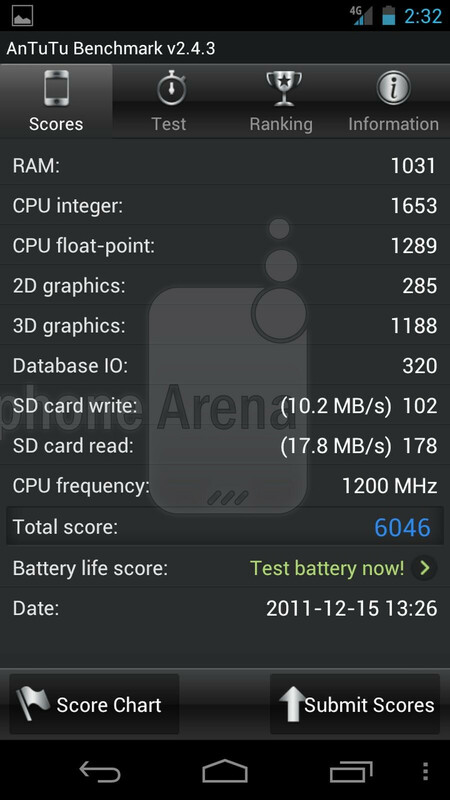 i can get 5200 on Antutu with my Droid 3 which has a 1GHz OMAP4 and it has half of the RAM the Rezound has. Those are some pitiful benchmarks I must say. I'm getting the phone regardless, because let's face it, the benchmarks don't tell the whole story and I imagine it will have some decent resale value. If the performance of the S4 or the quad cores live up to the hype I'm gonna jump ship on this phone rather quickly unless of course the Nexus just dazzles me.